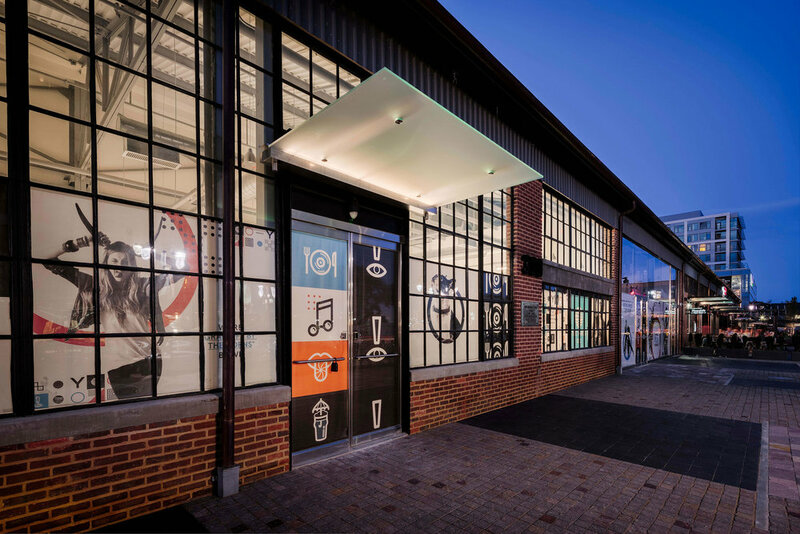 Located in the rapidly developing Navy Yard neighborhood, the Boilermaker Building serves as an important historic reference point within a sea of new construction. Formerly a military industrial facility serving the nearby naval base, the boilermaker building was reimagined as an important hub for retail and dining within Forest City’s development at The Yards. The design team was tasked with renovating the building and its surrounding landscape in order to integrate it with the larger development while acknowledging its historic character and significance. LAB, alongside Gensler, approached the site design with the intent of complimenting historic materials, providing functional and clearly organized spaces, and celebrating the urban character of the site and building itself. The site consists of a 50 foot wide sidewalk along Tingey Street, one of the primary retail streets in the neighborhood. The site design seeks to clarify and enhance the way the space is used. A large portion of the 50-foot sidewalk is separated from the sidewalk and pedestrian thoroughfare by rectilinear planting beds that complement the overall organization of the site. Paved areas adjacent to the building are articulated as a series of textural fields that play on the industrial vernacular of the building. Reusing rails, cobblestones, and bricks salvaged from the site in combination with new pavers create a memorable ground plane whose dynamic patterns allow for the area to be used in different configurations throughout the life of the building. The design celebrates the capture and conveyance of stormwater through the use of a series of weathered steel drainage channels that collect runoff and direct it to planted areas throughout the site. Overflow is treated by biofiltration facilities integrated in the streetscape along Tingey Street.